Solar Panel Array: 2 panels in series as 1 string, 2 strings in parallel. 48V DC pure solar powered air conditioners can work 100% by solar. No grid AC power supply required. AK series solar air conditioners are powered by DC power, no power inverter required. We design these AK series solar air conditioners for area with abundant sunshine, but without grid AC power supply, for example: unattended telecom towers, faraway farms, islands, construction sites, container houses etc. Besides normal operation at daytime, extra electricity generated by solar panels will be saved in a 4 x 12V battery bank for overnight operation. We design AK series solar air conditioners for tropical area. They can work well under +55 Celsius degree ambient temperature. 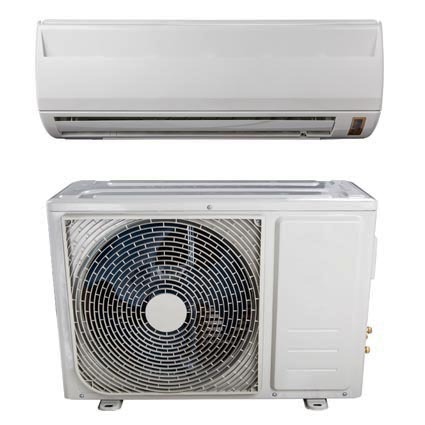 Taking advantage of inverter technology, and all DC driving components, the energy consumption will be 40% lower than normal air conditioners. We design a “hybrid control box” for AK series solar air conditioners. Power supply will be switched to 110-220V/50-60Hz/1Ph grid power automatically when voltage of battery bank drops down to 48V. When voltage of battery bank rise up to 52V after sunrise, the power supply will be switched back to battery bank automatically.